We are very happy that HR 8, the Bipartisan Background Checks Act of 2019, will have a hearing today in Washington, D.C.
HR 8 is a solid bill and Ceasefire Oregon firmly believes that every firearm sale or transfer should be subjected to a background check. In fact, 97% of gun owners support background checks for all gun sales. But Ceasefire Oregon has 2020 Vision. We are looking at the very near future when Democrats win the House, the Senate, and the Presidency, and to a time when strong, effective firearm laws can be passed without interference from the gun industry. By all means, let’s pass HR 8 in 2019, but let’s also begin a conversation about laws like permit-to-purchase, increased standards for gun ownership, mandated secure storage of firearms, and banning the assault rifles and high-capacity magazines that terrorize and kill Americans. Let’s look with clear vision to a future where we demand from Congress effective gun laws that are supported by a majority of Americans. In the meantime, please call your legislators and tell them to support HR 8. But also let them know you are expecting 2020 Vision with passage of permit-to-purchase, increased standards for gun ownership, secure storage, and a ban on assault weapons and high-capacity magazines. It’s been 20 years since Thurston and Columbine. We’ve waited long enough. Time for 2020 vision and 2020 leadership. P.S. 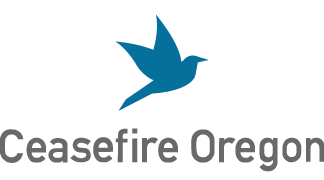 Keep up to date on Oregon’s firearm-related bills on Ceasefire Oregon’s Legislation page and on the federal bills on our blog.